A Warm Welcome to the InterNations Frankfurt Community! This will be a great opportunity to meet other Newcomers and our Ambassadors & Consuls who organize the Amazing Events and Group Activities in our community. 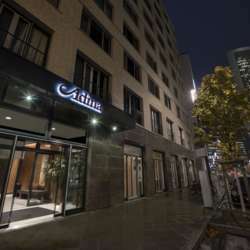 The event will take place at the Adina Apartment Hotel Neu Oper, which is very close to the banks of the river Main. The hotel is walking distance from iconic sights including the historic Römer, Frankfurt Cathedral, Goethe-House and St. Paul’s Church. We will get together at their in-house cosmopolitan lounge area, Alto Restaurant and Bar. The Ambience of this place is Great with a bar area and some Amazing drinks. You are welcome to invite your friends, however kindly ask them to register with InterNations first. We are excited to have you be part of our community and look forward to meet you!